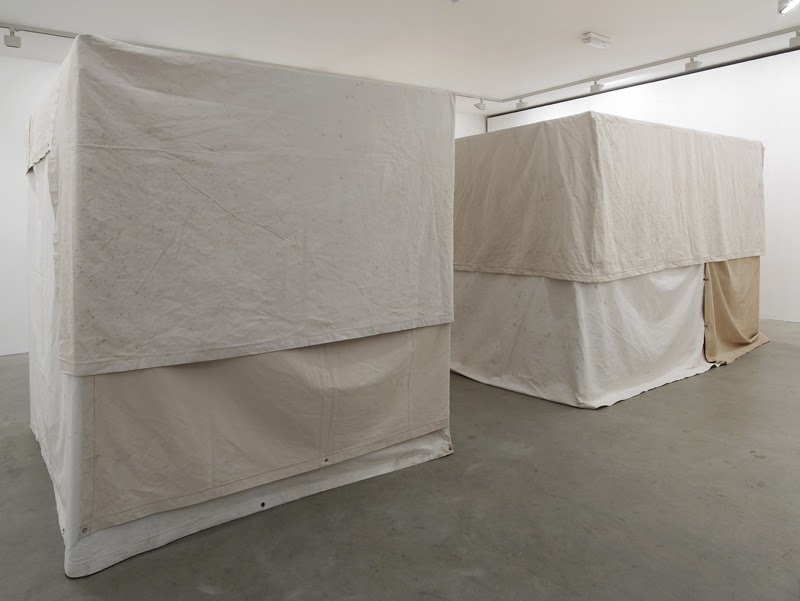 Visitors to Brian Griffith's show at Vilma Gold might be perplexed to find what appears to be a series of large scale cuboid sculptures still draped in their protective dustsheets. Four bulky, loose-fitting tarpaulin coverings dominate the small gallery space, leaving only narrow corridors which, when navigated, reveal no new aesthetic features of the work but two further near-identical works in the second room. There is curious tension between the dominant presence of the work in the space and the anti-aesthetic banality of its materials: patchy, off-white fabric hanging soberly over concealed industrial frames.The piece demands attention with its large scale, but its modest materials makes it strangely anti-climactic: what in The Invisible Show are we meant to be looking at? The immediate reaction is to find out what is hidden beneath the tarpaulin. Curiosity and slight trepidation leads us to discover a rare gap in the fabric which reveals: empty space. 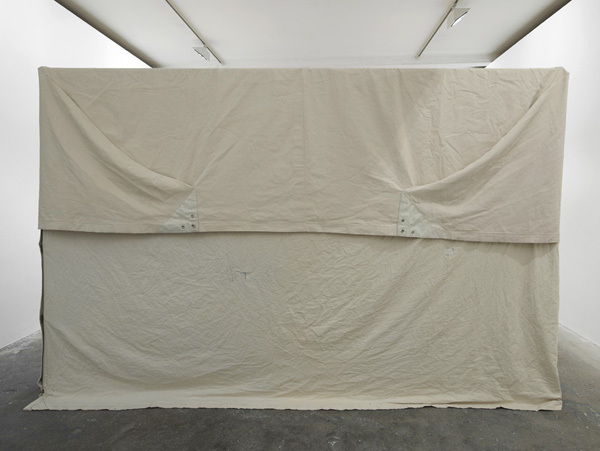 Each structure bounds a void; Griffiths really has produced an invisible show. Griffiths plays with the occasional incongruence of the actual physical form of an object and our expectation of it through association. Since the 1990s he has found new ways to interrogate our familiarity with common objects by altering their scale, colour or materials. Often these transformations have a somewhat sobering effect on a once-cheerful object. In his studio, soft toys are blown to massive proportions as daunting bulbous sculptures in brick; bear heads transformed into eerily sagging tents, badly rigged to the ceiling; recycled materials are cobbled together to form an eccentric but somewhat funereal gypsy caravan. The Invisible Show opens to myriad associations. Perhaps the structures are wartime medical tents or forensic crime scenes, cleared of all trace of activity. Or perhaps, with their inexpensive supports and thin rope looped through metal eyelets, they are circus tents or travelling fairground attractions; here deserted, and drained of colour. Through this imaginative link with the boldly coloured, shiny fairground tarpaulin of childhood memory, the dismal, stained material, flung unceremoniously over its frame, seems all the more vacant and cheerless. These gloomy connotations fit nicely with Griffiths’s homage in the exhibition title to H.G. Wells’s The Invisible Man. And yet, there is a lighter side to the work: Griffiths’s mischievous enjoyment in perpetuating our curiosity with his girded voids. The very ‘invisibility’ of the show opens it out to inventive possibility; Griffiths has created an arena that regenerates a childlike capacity to mentally transform the most banal of scenes into new, imagined environments.